After I first started working (God knows how long ago), a friend approached me and helped me get a credit card through her brother-in-law who was a credit card consultant. I tried to apply for one before that but my application was turned down. It was harder to apply for credit cards those days. When I got my first credit card, I was ecstatic. Credit cards can be friend or foe. No doubt, it was invented for convenience but if you do not use it properly, it can ruin your life. Fortunately, from day one, I never get myself into credit card debt. I am NOT saying this to brag. It hurts my heart when I see many people, not only youngsters but parents and adults as well, are deep in credit card debt. And worse, some are declared bankrupt due to this. Based on my zero credit card debt record, I guess I am qualified to share with you 5 ways on how to eliminate credit card debt or not to be in it from the get-go. 1. 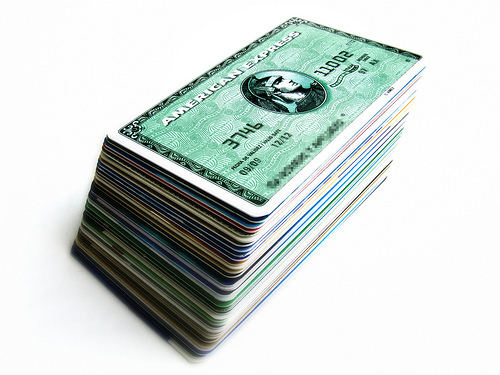 Get Only One Card – Yes, you don’t need a pile of credit cards in this civilization. All you need to have is only one (I currently have two: one for offline and the other online). Some financial experts say you should cut off all the cards. But for convenience’s sake, I will advise you to keep one just in case you need to use it. If you have problems controlling your spending, as the last resort, I would advise you to follow the expert advice of getting rid of all your credit cards. Use cash only for your purchases. 2. Buy Only What You Can Afford… Cash – This is where most people make mistake. They think by using credit card to buy things, they don’t need to pay immediately. I always use this strategy before I hand out my credit card to the cashier: If I were buying this with cash, could I afford it? If the answer is no, I will not buy it even on credit. I use credit card not because of the credit it extends to me but as a convenient tool for shopping without carrying too much cash. 3. Pay Off Your Balance Every Month – Once you receive your monthly credit card statement, pay it immediately… in full. Not the required minimum payment but 100% of the balance. This strategy works very well for me and it’s a good way to maximize the benefits of a cash back card too, if you have one. I never fail to pay off the balance I incur every month of the year. If you fail, the debt will snowball until the debt is so big that you can’t imagine how to pay it off. To make things worse, the interest on the debt is astronomical. Credit card debt is not the kind of loan that you want to take. It’s a bad loan that you must avoid like the plague. 4. Set Up Automatic Payment – You can skip this step if you can manage well Tip #3. But if you have a problem paying off the balance very month, set up an automatic payment with your bank to pay off your credit card balance. Once this is set up, rain or shine, your credit card balance will be paid off automatically. I personally don’t need to use this approach but I get the inspiration from David Bach’s The Automatic Millionaire. If you have already incurred a credit card debt and are looking for ways to reduce it, this method is still relevant. Decide and allocate a monthly amount which you can use to pay off the credit card debt. Set it up as automatic monthly payment. Do this until you have cleared all the debt. Also if you have extra income (eg: bonus), use it to pay off your debt. In the meantime, don’t incur any new debt. Use only cash to buy, not credit card. 5. Be Wary of The Consumerism Trap – This tip is more about your attitude. Don’t fall prey to the commercials that bombard you from the moment you wake up. You don’t need the latest models of everything. Live a simple life and focus on thing that matters most to you: people you love. In so doing, you reduce the number of purchases. Hence, reducing the credit card debt. These steps seem simple. But getting rid of credit card debt requires a high degree of self-discipline. You can do it once you are committed to it. The key is to pay off your balance every month and reduce your spending by having the courage to beat consumerism. Once you learn this, why not teach it to your children?